The Pacific Northwest is a prime location for fossil fuel companies to export goods to Asian markets. With open U.S. policies on global energy exports, the only thing standing between the fossil fuel companies and the Pacific Northwest coast are teams of environmentalists. This task has not been taken lightly; environmentalists are standing up to the fossil fuel industry in a big way. This page will give an overview and serve as a resource guide for some of the organizations and activists fighting to protect the Pacific Northwest and the Earth from the expansion of fossil fuel infrastructure and exports. Columbia Riverkeeper is the leading public interest group working to protect the Columbia River in the Pacific Northwest. With headquarters in Portland, Oregon, the organization works to protect the river communities, people, fish, and wildlife that depend on the Columbia River. Their history includes years of aggressive advocacy, direct action, and litigation against fossil fuel companies and projects. According to their website, "While we utilize sophisticated scientific, legal, and policy tools to protect the river, we remain a grassroots organization at heart – powered by the river people and river ideas in river communities." You can follow this link to learn more about Columbia Riverkeeper. Power Past Coal: Power Past Coal is an expansive coalition of health, environmental, business, clean-energy, faith and community groups working to stop coal plants, and coal exports from the West Coast; more than 100 organizations are part of the coalition. Stopping new coal export off the West Coast continues to be a major stake in the ground for the climate movement, and the Power Past Coal coalition works diligently to protect the Pacific Northwest and help move us toward a clean energy future. Check this site to find out more about Power Past Coal. Stand Up To Oil: With coal in a steady decline, fossil fuel companies are turning to oil shipments and crude oil exports (See Coal, Bitumen). Stand Up To Oil is a coalition with many of the same groups involved in Power Past Coal; these groups oppose new oil terminals and any increase in oil transport through the Northwest. The coalition is also working to improve safety measures for oil currently traveling through the region. Stand Up To Oil is active in fighting big oil companies through organizing direct action events, advocacy, and raising community awareness and involvement. To find out more about Stand Up To Oil, check here. Climate Solutions: A member of both Power Past Coal and Stand Up to Oil, Climate Solutions is a Northwest-based clean energy economy nonprofit organization with a vision of cutting global warming pollution and accelerating the transition to clean energy. From their website: "For close to 20 years, we have been an active catalyst and advocate, building a powerful constituency for local, regional, national, and international action on climate and clean energy." Here's a link to their website for more information about Climate Solutions. 350 Seattle: Also an active member in both Power Past Coal and Stand Up To Oil, 350 Seattle is a grassroots organization passionate about climate and ecological justice and dedicated to direct action through nonviolent civil disobedience. 350 Seattle, part of the global 350.org network, is active at every level–including direct action, policy, and education. From their website: "The fight for climate action is the fight for a living planet; nothing has ever been more important. Everyone has skills and energy that we need. Please join us!" Check out their calendar to learn how to get involved and help stand against fossil fuels in the Pacific Northwest! Washington Environmental Council: "Washington Environmental Council is a nonprofit, statewide advocacy organization that has been driving positive change to solve Washington’s most critical environmental challenges since 1967. This longstanding organization has been critical in developing and maintaining Washington state environmental policy. WEC was instrumental in passing (and now enforcing) the foundational laws that help keep Washington’s environment healthy: the State Environmental Policy Act, the State Superfund Law, the Growth Management Act, and the Shoreline Management Act--all of which help to regulate the fossil fuel industry. To find out more about Washington Environmental Council please check out their website. Washington Conservation Voters: Washington Conservation Voters serves as the statewide political voice for the environment. This organization is highly involved in the advocacy of effective and responsible environmental policies in Washington. They also work to elect environmentally responsible candidates to state and local offices and to strengthen laws that protect the health of Washington's communities and economic future. Washington Conservation Voters are active across the board and essential on the political side of standing up to fossil fuel companies. Check here for more info. Earthjustice: Although not exclusive to the Pacific Northwest, Earthjustice is a non-profit, public interest law organization dedicated to environmental issues. From their website: "As the nation’s original and largest nonprofit environmental law organization, we leverage our expertise and commitment to fight for justice and advance the promise of a healthy world for all. We represent every one of our clients free of charge." With many landmark victories, Earthjustice has built a track record of success based on unparalleled legal and policy expertise and close collaboration with a diverse array of clients and coalition partners, from grassroots and community groups, to large national organizations. With direct involvement in the Pacific Northwest fossil fuel wars, check out more information on Earthjustice here. RESources for Sustainable Communities: RESources is a non-profit environmental education organization founded in 1982 which promotes sustainable communities and protects the health of northwestern Washington’ people and ecosystems through application of science, education, advocacy and action. Their programs include Clean Energy, Clean Water, REStore, Sustainable Schools, and Low Carbon Living. RESources works with Power Past Coal and Stand Up To Oil, as well as several organizations in the Skagit and Whatcom county areas to fight against fossil fuel companies. To find out more information about RESources, check out their website and events. Northwest Energy Coalition: The Northwest Energy Coalition is an alliance of about 100 environmental, civic, and human service organizations, progressive utilities, and businesses in Oregon, Washington, Idaho, Montana, and British Columbia. This organization promotes development of renewable energy and energy conservation, consumer protection, low-income energy assistance, and fish and wildlife restoration on the Columbia and Snake rivers. For more information on the Northwest Energy Coalition check here. Rising Tide: With locations based in Seattle and Portland, Rising Tide is a direct action organization working to confront the root causes of climate change and support communities on the frontlines of extractive, fossil fuel industries. From Rising Tide Seattle: "We are committed to stopping the extraction of fossil fuels and preventing the construction of new fossil fuel infrastructure. While doing so we work toward a just transition to sustainable livelihoods." And from Portland Rising Tide: "Portland Rising Tide does combine long-term strategic campaigning with educational events to raise awareness and build capacity in our community to stop the plunge into climate chaos." Check out Rising Tide Seattle here and Portland Rising Tide here. 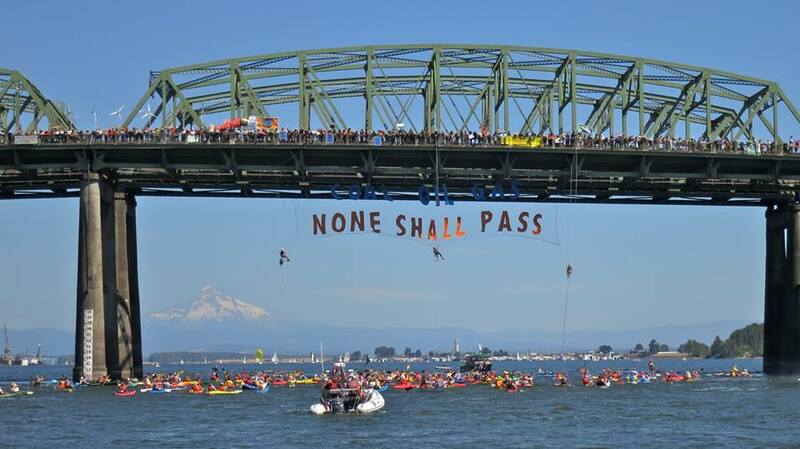 sHellNO: ShellNo is a Seattle-based coalition of activists, artists and environmentalists battling Shell and Arctic drilling. This direct action organization is very active in standing up against fossil fuels in the Pacific Northwest. According to their website: "Organizations that make up the sHellNo.org action council include Rising Tide Seattle - Stop Shell Seattle - Bayan Pacific Northwest - 350 Seattle - Backbone Campaign - ShellNo Action Council - Portland Allies with the Climate Action Coalition - Bellingham Allies with ShellNo Bellingham - Alaska Allies with ShellNo Alaska." To find out more about ShellNo check out their Tumblr and Facebook page. Aside from following any of the above organizations on social media and signing up for their newsletters, a great way to stay up to date on issues around the Pacific Northwest is through the Sightline Institute. Sightline Institute is an independent, nonprofit research and communications center founded by Alan Durning in 1993. "Our work includes in-depth research, commentary, and analysis, delivered online, by email, and in-person to Northwest policy champions, emerging leaders, and a range of community partners." Sightline Institute’s mission is to make the Northwest a global model of sustainability—strong communities, a green economy, and a healthy environment. For more information check out their website here and sign up for their newsletters. *By no means are the above-listed organizations the only ones standing up to the fossil fuel industry in the Pacific Northwest. This list is not comprehensive--and not meant to place any order of importance on the groups that are listed. These are simply the main groups we encountered while studying the Pacific Northwest fossil fuel connections. There are many more fighting the good fight, but here is a list of a few additional non-Native groups we came across in this study.